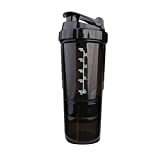 Sports protein mixer shaker shaking cup water drinkware tool. 500ml removable three protein powder shaker cups sports cup spider water bottle. The product is recyclable and made of non-toxic material.